The new construction consists of a continuous concrete slab, which is support by drilled piles. Two thirds of the 142m long concrete slab are resting on existing ground whilst the remaining third cantilevers out. The advantages of this construction are the economical construction and reduced maintenance costs since the construction requires no expansion joints and bridge bearings. The difficulties are in the monitoring of the constraint stress due to temperature variations. By means of continuous monitoring the displacements of the supporting structure are observed over a long period and the given bridge movements are compared with the results of numerical simulating. 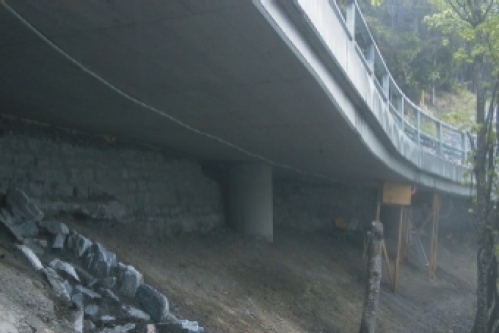 Also, this kind of construction should provide knowledge on the long-term behaviour of joint-less bridges.